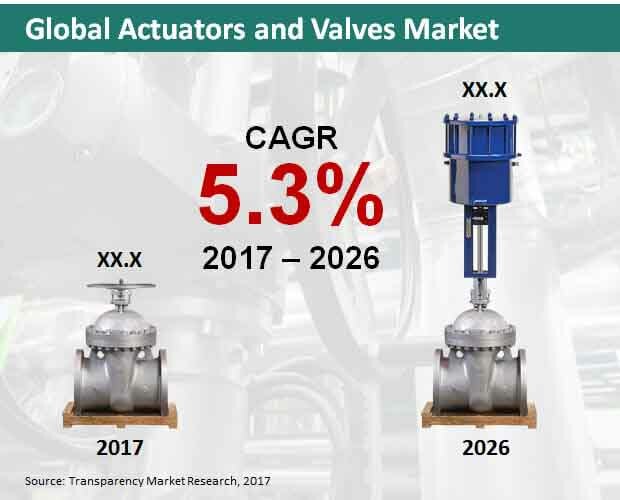 The global actuators and valves market portrays a is highly fragmented in nature owing to presence of a large number of small and medium scale manufacturers, states Transparency Market Research. Actuators and valves market are largely driven by product launch and acquisition. For instance, Honeywell International Inc. announced a new range of 2-way and 3-way ball valves suitable for a wide range of heating, ventilating, and air conditioning applications. The Honeywell range of ball valves and actuators is designed to maximize the key features required to give specifiers, installers, and users the most cost-effective solution. Moreover, expansion and agreement are other wining strategies adopted by key players. Some of the major companies in the global actuators and valves market are Honeywell International Inc., AVK Holdings A/S., Flowserve Corporations, Schlumberger Limited, Emerson Electric Co. Rapid urbanization and industrialization have triggered the demand for energy. As a result, several countries have initiated oil and gas exploration activities. Large oil exploration companies and oil and gas exporting countries, such as Russia, Canada, Saudi Arabia, U.K., and Netherlands, are tapping into opportunity to increase their revenues and expand their market shares. The water and wastewater treatment industry are also a major user of industrial valves and actuators. Surging demand for good-quality water is one of the primary growth stimulants for the market. Industrial valves and actuators play an essential role in monitoring and controlling water treatment and transportation activities efficiently and subsequently enhancing the productivity and augmenting efficiency of various processes involved in treatment of water and wastewater. Growing automation in the water and wastewater treatment industry is poised to provide a fillip to the market. The study presented here is based on a Transparency Market Research report titled "Actuators and Valves Market (Product Type - Manual, Hydraulic, Pneumatic, Electric, Mechanical, Other Actuators, Quarter Turn Valve, Multi-turn Valve, Control Valve, and Other Valve Types; Applications - Agriculture, Mining, Minerals and Metals, Chemicals and Petrochemicals, Automotive, Energy and Power, Oil and Gas, Paper and Pulp, Pharmaceuticals, Water and Waste Water, and Other Application) - Global Industry Analysis, Size, Share, Growth, Trends, and Forecast 2017 - 2026."